Conflict Management Media: Episode #16 – Mac and Cheese Boy – Conflict Research Group, Intl. In this episode, we learn from a conflict between a drunken University of Connecticut student and the cafeteria manager. 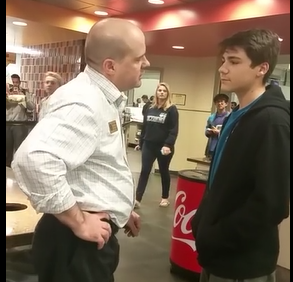 The student demands to be served Mac and Cheese, but the manager refuses and the situation escalates. Considering the manager and the workers there aren’t necessarily trained to handle situations like that, they handled it pretty well, I think. The kid could have gotten taken to the floor a lot sooner than that, for sure, but again, I doubt either of them expect to have to handle things like that regularly. As soon as the manager threatened to call the cops, that call should have been made (maybe it was). It was clear that no one wanted to hurt the kid, despite how utterly vile his behavior was. The officer rushing him through the double doors after he spat was totally appropriate. I hope that the pushing, the menacing, and the spitting, especially since it is all on video, amount to a charge each. Ideally, the situation should have been taken care of at least 5 minutes sooner than it was. But considering again that the staff is not trained to deal with that, I still think it was handled well. I hope charges are pressed against the young guy-it’s clear he won’t learn unless he is punished. I tend to think anyone working in service near a college campus should have some kind of crisis training and guidelines to follow in instances like this. From an effectiveness standpoint of conflict management, the manager was in over his head. His non-physical response to the initial multiple pushes by the student demonstrated his unwillingness to use force. As a result, he lost his enforcement authority. That was the point in which he needed to bring in the police and additional staff to reinforce his position. 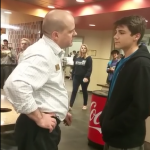 As a practical matter, the manager had little to gain from entering into a physical confrontation with the student. Remaining calm and not physically engaging the student was the lowest risk response considering his job position. While a earlier physical response may have ended the confrontation sooner and more effectively, it also could have resulted in backlash from his employeer in the event someone incurred an injury. This video shows the importance of employers providing people who deal with the public effective training and guidelines on conflict management. Apparently, the student was expelled from Uconn immediately following his arrest. Given the notoriety his actions have received, it is likely that his job prospects has vastly deminished. Posted in: Conflict Mgmt Media - C.M.M.